In 2011, we received a 3-year Title II grant from the USDA Forest Service to assist the Ottawa National Forest (ONF) in their invasive plant monitoring and control work in Sylvania and Perimeter Area. In the fall of 2012, we received additional funding to continue the project for another 2 years. The grant permits us to hire 2-3 part-time interns and to buy some tools and supplies. The project coordinator, project assistant, and all other personel providing assistance are volunteering their time. Our Annual Report to the US Forest Service summarizes our work. Take a look at our Blog to see what we are doing this year. We co-sponsore talks at the ONF Visitor Center and hikes through the forest. Click here for more information and pictures of past events. For many years, only one type of flower grew in the L-shaped flower box next to the day-use building: Dendalion. In 2010, with support from the ONF, we began to establish a native plants garden. Our goal is to turn this box into an educational 'native plants garden'. Specifically, we are planning to have several similar-looking plants, such as a variety of ferns, growing next to each other so that visitors can study the small differences and will then be able to identify the plants in the wild. 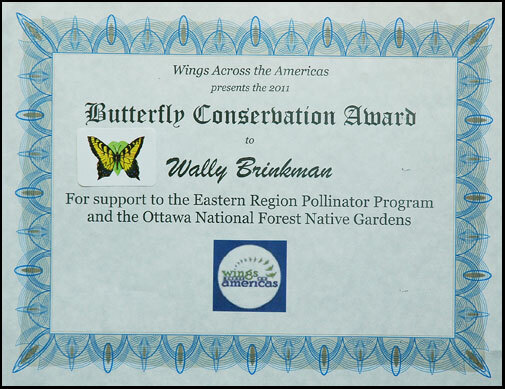 for support to the Eastern Region Pollinator Program and the Ottawa National Forest Native Gardens. For more information and pictures, please click here.